Business Analysis: Function Modelling Using IDEF0. A practical approach to IDEF0 international standard in business analysis, data analysis, systems engineering and more. Ideally to have used at least one kind of graphical modelling tool in the past, e.g. flowcharts, etc. IDEF0 graphical language is an International Standard (ISO/IEC/IEEE 31320-1:2012) for information modelling. 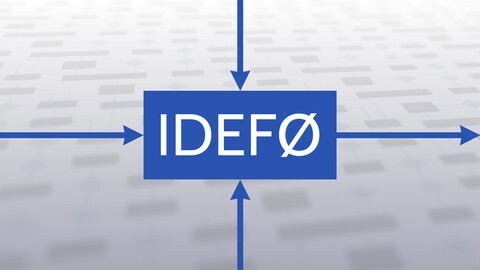 IDEF0 is a powerful, yet simple, structured modelling method that allows you to visually represent the different levels of granularity of functions (also activities and processes), their inputs, outputs, mechanisms and controls. Therefore, IDEF0 will equip you with a very useful addition to your toolkit of techniques for information modelling and representation. In this course you will learn IDEF0 from a practical perspective. The course covers all the necessary explanations around the fundamental and most commonly used building blocks of the graphical language, describing their meaning and how they are used. This leads to a number of examples and case studies that are discussed, analysed and solved so as to provide you with the best applied knowledge of IDEF0. You are also shown some key ways for practically presenting your models. A wealth of downloadable resources is provided, ranging from Microsoft Visio templates to fully-worked solutions, images, slides and more. This course is chiefly targeted at business analysts, information modellers, data analysts, systems engineers, design engineers, etc., of all levels and who do not have prior exposure to IDEF0. Additionally, you are very welcome to take the course if you have an interest in the area of information representation through visual methods.